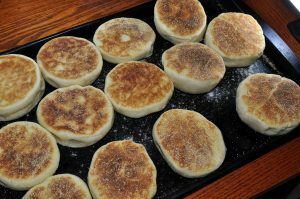 English muffins are a yeast-based dough. It is a small, round, flat (or thin) type of yeast-leavened bread which is commonly sliced horizontally, toasted, and buttered. These are a favourite for breakfast, with butter, or jelly on top. Combine milk, sugar, salt and margarine. Measure water into large warm bowl, sprinkle in yeast, and stir until dissolved. Stir in milk mixture and 3 cups flour; beat until smooth. Add enough additional four to make a stiff dough. Turn out onto floured board and knead about 2 minutes, or until dough is manageable and can be formed into a ball. The dough may be slightly sticky. Cover; let rise in a warm place, free from draft, until doubled in bulk, about an hour. Punch dough down; divide in half. On a board, heavily sprinkled with cornmeal, pat each half into a ½-inch thickness. Cut into circles with a floured 3-inch cookie cutter. Place on ungreased baking sheets about 2 inches apart. Cover and let rise in a warm place, free from drafts, until doubled in size, about ½ hour. Place on lightly greased medium hot griddle or skillet, cornmeal side down. Bake until well browned, about 10 minutes on each side. To serve, split in half and toast. You can also start the dough by mixing the yeast, the dry ingredients, and half or more of the flour, with the liquids at 145°-150°F, then continuing the rest of the instructions. After punching the dough down, many bakers let it rest 10 minutes. ½ cup of currants may be added to the warm milk mixture. You can substitute 1½ cups whole wheat flour for 1½ cups of the all-purpose flour.